Hampstead, 2017. PG Starring: Diane Keaton, Brendon Gleeson, James Norton, Lesley Manville. Directed by Joel Hopkins. Running time: 103 minutes. One lone man daring to interfere with the evil plans of the rich and powerful: it’s not exactly a new angle, but there are a few scraps of satisfaction to be found in Joel Hopkin’s latest film Hampstead—just not in the realm of originality. It’s a sleepy story that meanders along with a mildly pleasant mediocrity. If you felt like switching your brain off and staring at beautiful British countryside, this could be worth a view. 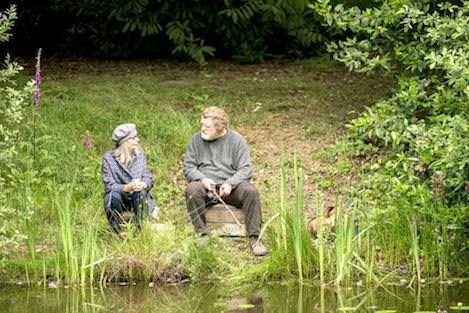 In the latest performance from acclaimed actors Diane Keaton (playing Emily) and Brendan Gleeson (playing Donald), we learn about hermit Harry Hallowes – a real person who in 2007 won squatter’s rights to the land he’d been self-sufficiently living on in London’s upmarket Hampstead Heath. Despite its being based on a true story, the film feels like a cutely contrived fantasy ideal for Annie-Hall-nostalgic seniors with a heart condition—due to the fact it is a rom-com that appears to have all the actual surprise or excitement taken out. Recently widowed, Emily is part of wealthy clique in London’s upmarket suburb of Hampstead (to give some perspective, recent figures state the average house price in the area is £1,545,448). As she faces her rather dull day-to-day activities sans her late husband, she begins to realise the layers of inauthenticity that have plagued her life for some time. We learn quite quickly that her husband was a philanderer. There are also indicators that, while still alive, he did not plan for their financial security and died leaving a big pile of debt. Meanwhile, Emily’s conservative ‘friends’ are campaigning to have an old hospital knocked down and an apartment block developed at the famous Hampstead Heath. The group’s ringleader aims to coerce Emily, and the rest of the ‘ladies who lunch’, into supporting her campaign. Little do they know that a gruff Shrek-like swamp-dweller, Donald (Gleeson) has been squatting in a ramshackle house in the heath for 17 years. Emily and Donald serendipitously meet in a fanciful rom-com way, and the conflicts of interest, and characters, begins. The film has the feel of a slap-job patchwork quilt; there’s some very pretty bits, some old bits, perhaps a little square here and there, that hint at meaning. But overall it feels like disparate pieces sewed together for plot convenience. "It becomes a classic battle between faceless corporate Goliath and ‘little guy’ David." Emily’s friendships with her rich meddling matriarchs seem entirely unreal, and it’s hard to swallow the notion that she was ever close with them. There’s no clear narrative that indicates how her life got to this point, or why she’s so dissatisfied with it now. As for Donald’s character arc, it is equally indistinct. We are dealt another trope; a stoic man injured in love a long time ago who has not dared to love another since. Now, awakened by the right woman, he is learning to love someone new after so many years alone. Of course it’s a nice idea, particularly in these sorts of films, but the depiction of Donald’s life and story smacks of—to use the word again—contrivance, and thus it seems to lack depth. His character could have been richly imagined, yet it seemed there just wasn’t much of substance for him to say. Hampstead has a couple of redeeming points however, beyond the pretty cinematography—and does manage to raise some contemporary issues. Donald lives ‘off the grid’, growing his own vegetables and fishing for his dinner. He generates his own electricity, and is warmed by a fire he makes in a discarded conventional oven. His shack is made entirely from recycled materials, and he has seemingly no need for money. When he is eventually taken to court by the company looking to clear his house and build apartments, it becomes a classic battle between faceless corporate Goliath and ‘little guy’ David, with a humble legal aid lawyer in place of a slingshot. While on the stand, the prosecuting lawyer asks Donald what he has contributed to society; has he paid taxes, or council rates? Has he worked a job that contributed, as others in the room do? Donald’s retort is that he has grown his own food, caught his own dinner (fish) and generated his own electricity for 17 years—while causing no harm to anybody. His carbon footprint being therefore non-existent, he reckons he has done more for humanity and the planet than the prosecutor. It’s a point tidily made, attracting cheers from a throng of millennial-aged supporters who have gathered to show their (albeit unsolicited) support for Donald. In this way, there is a clear dichotomy between high-wealth baby boomers wanting to bulldoze and erect profitable apartments, and the younger, and more ecologically aware, generation organising protests and standing up for ‘the little guy’. Whether this is fair or not, it seems to be a subtle message from the film. As in one or two other scenes, there was a glimmer of a real statement being made. At the same time, none of the points about wealth-obsession, ecological recklessness, squatters rights and so on are particularly strong, or approached with anything much more than a superficial nod. If you don’t want to think much; if you appreciate a predictable moral victory, a quaint soundtrack and a film that vacillates between relaxation and tedium – Hampstead might be for you.